With another St. Patrick’s Day in the books, we can say farewell at last to a winter that, at least in my part of the world, won’t let go. Or if you’re on the meridional portion of the globe, summer ebbs for a more clement season. So long extremes, hello migration! Of course, snow and cold still dominate upstate New York, but beautiful, belligerent Blue Jays don’t much care; some have lingered throughout the dark months, but fresh reinforcements have arrived to stake out territory. 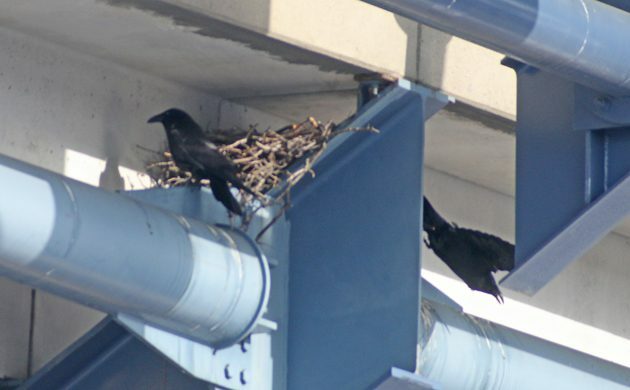 Speaking of corvids, Corey’s Best Bird of the the Weekend was actually his best birds of the weekend, a pair of Common Ravens attempting breeding for the second year in a row on Arthur Ashe Stadium in Flushing Meadows-Corona Park. Maybe they like tennis? Recently hatched Black-winged Stilt chicks crossing the flooded highway near Broome! Safely across the road and into the undergrowth! Mangrove Hummingbird for me- an endangered species endemic to Costa Rica. Had a great weekend, with a lot of shorebirds, but have to go with the Wandering Tattler I found on the Pacific side of the Baja. What Is Odd About This Picture?